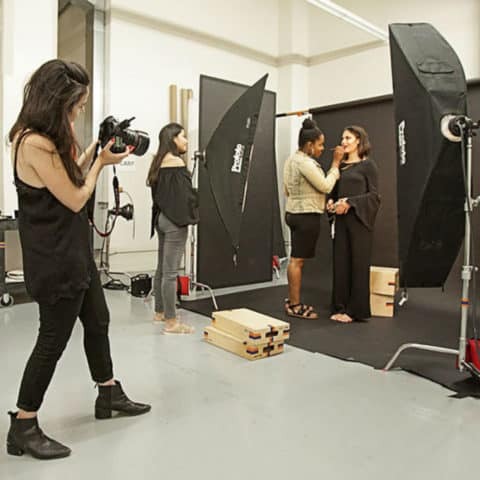 You will learn in a creative environment and in a photography studio equipped with the newest technology, which will free you to realize anything you can imagine in traditional and new media. Check out cameras, lenses, and lighting equipment in our well-equipped facility. Traditional darkrooms are available for film processing and printing. Access the latest digital imaging hardware, software, large-format printers, flatbed scanners, digital camera backs, and dedicated large-format film scanners. Spanning three buildings, the facilities of our School of Photography feature a wide range of traditional and digital equipment, including digital cameras, lenses, lighting, darkrooms, studio space, and more.